The Sustainable Warburton Project is an Australian-first research and practice based design and planning project focused on Aboriginal settlement planning, involving an Indigenous community (Warburton and the Shire of Ngaanyatjarraku, industry (AECOM) and academia (University of Western Australia, Monash University and RMIT University). Collaboratively led by AECOM, the University of Western Australia (UWA) and the Shire of Ngaanyatjarraku, its objective is to create new and improved urban spaces, and improve health, education and social structure in Warburton. It is a groundbreaking model that aims to transform how Indigenous people live and could be applied to Indigenous communities across Australia and around the world. Warburton is a remote town in Western Australia and one of 10 communities in the Shire of Ngaanyatjarraku, located 920 kilometres northeast of Kalgoorlie and 500 kilometres southwest of Uluru. The shire covers almost 160,000 km2 of the traditional lands of the Ngaanyatjarra people of the Central Desert of Western Australia. With a district population of just over 1,800, the Ngaanyatjarra people are predominately concentrated in Warburton, with a population of approximately 600. The Sustainable Warburton Project brings together Aboriginal community members, academics and industry professionals for formal and informal discussions about community needs and projects to enhance the community. 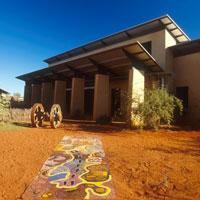 developed outcomes form part of a greater discussion about planning in Aboriginal settlements. Identify project opportunities that arise from community need. Develop meaningful designs that meet academic requirements and could be used to secure funding for development. Design, develop and document funded projects in a professional environment with appropriate processes and insurance. Involve students as interns as their projects are developed under guidance and become built outcomes. Repeat the project over a period of time, to work through a series of design problems and opportunities. Include more graduates as the project continues to build knowledge, and maintain relationships and continuity of service with the community. The intention of adopting social, academic, professional and corporate responsibility objectives is to develop quality solutions that have a broader application than just the Warburton community, with the potential for both the model and its findings to be repeated in other community areas. The Sustainable Warburton Project evolved over a number of years through discussions involving the Shire of Ngaanyatjarraku, the UWA and AECOM. In 2010, three UWA postgraduate students in architecture and landscape architecture took part in a trial of the Sustainable Warburton Project as part of their coursework, under the guidance of AECOM specialists and UWA professors. They met with Aboriginal community members to discuss their needs and presented their developed ideas to the community. The students worked towards specific and broad outcomes related to Aboriginal settlement at Warburton in response to observed conditions. A project design for a community college won two top student architecture awards, including UWA’s Hassell Prize for Independent Design and the Cameron Chisholm & Nicol Architectural Award. It is a unique and contextual design offering a series of spatial opportunities for women’s meetings, a library, and reading and other informal and formal gathering opportunities. Three projects were submitted to the Federal Government for funding consideration, including the community college and two landscape architecture projects. One involved introducing urban agriculture into Warburton by planting orange trees throughout the town. Irrigated with treated wastewater, the trees address water scarcity and provide shade, a food source, protection from dust and improved community health. The second project looked at housing arrangements and clusters that work more harmoniously with the way Indigenous families gather together. Other projects include an arts facility, a repository and gallery extension, a tourist precinct and gateway experience and town parks. Jon Shinkfield is a principal and director of design and planning at AECOM Australia. He took on the role of project director for the Sustainable Warburton Project. Jon Shinkfield has written 1 articles for us.